Following Fashion Revolution week back in April, I think we’re all that little bit more conscious about the supply chain within the fashion industry which can be a scary place. Buying ethically and supporting companies that do take the time and effort to ensure the welfare of their workers and their environmental impact is something we can all do to help (at least a little bit). So when Thread approached me to collaborate I didn’t hesitate! Thread is an environmentally, and socially conscious certified B Corporation on a mission to end poverty by creating dignified jobs and responsible, sustainable, high-quality fabrics. Based in Haiti and Honduras, they recycle plastic waste to create jersey, denim, fleece and canvas fabrics. They create thousands of jobs for locals in a transparent, circular supply chain. Let’s face it, that’s just awesome! I picked up some of their light heather grey jersey and the matching rib knit. The jersey is made from 50% recycled plastic. It’s surprisingly soft and you can feel the quality straightaway. There’s no way to tell what this fabric used to be! 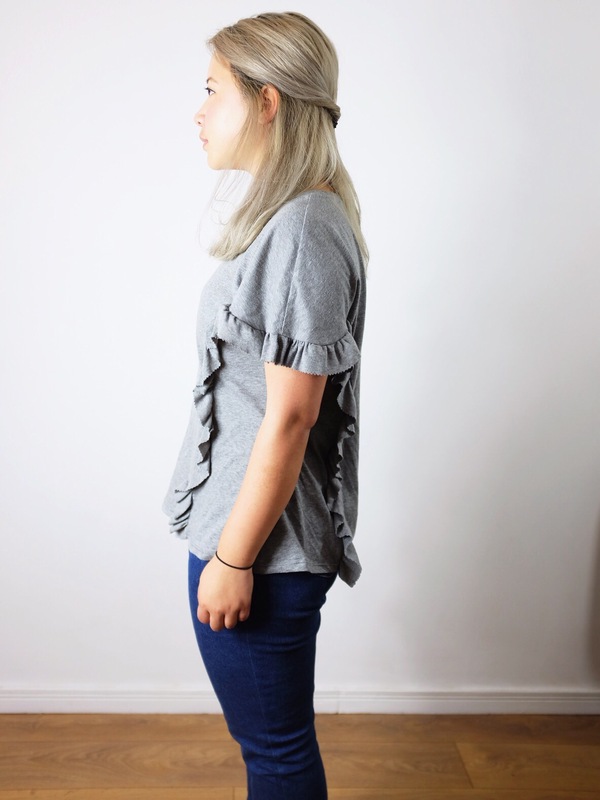 So, I went for a self drafted ruffle tee in the end. I had an idea for a ruffle going from the front, right around the sleeve and down the back. I couldn’t get it out of my head! I used a dropped shoulder RTW t-shirt I already owned as a guide, extended and squared off the sleeve edge. I drew in a line where my ruffle would go and separated the bodice into two pieces. 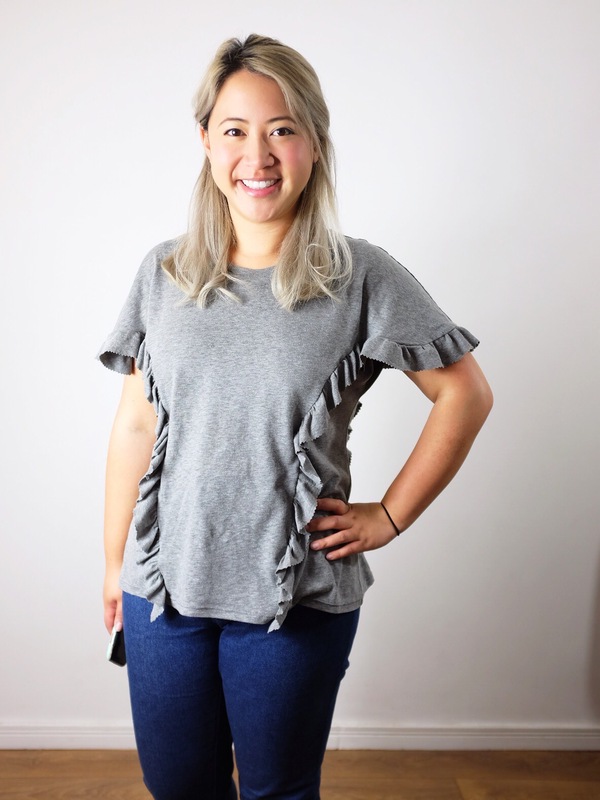 The ruffle was made with a super long gathered strip of rib knit. I love it! It turned out exactly how it did in my imagination! It’s ruffles galore but also really wearable. It’s great with jeans and also tucked into skirts. It’s my new wardrobe fave! Thread are also offering you guys a discount on their fabrics. 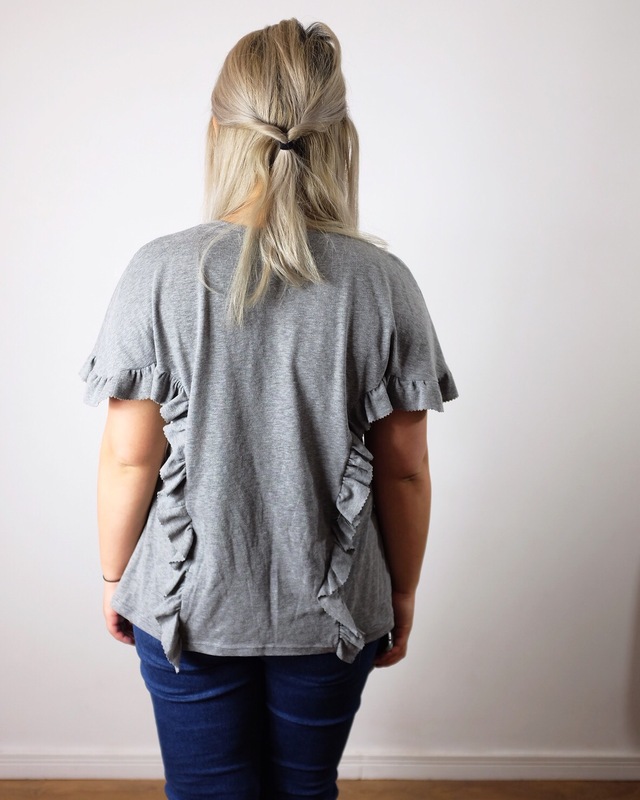 Just enter EMILY10 at the checkout to receive 10% off! The discount code is valid until the end of June. I love this shirt! The ruffle is placed in a very flattering way, and finishing it with pinking shears is such a fun detail!